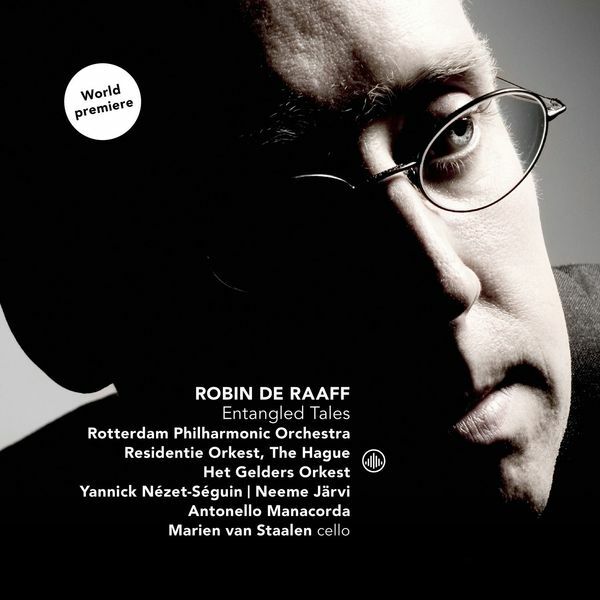 I have recently been in touch with Robin de Raaff (1968*) in order to update my lcontemporary operas list, whiwh made me discover this CD of some of his orchestral music. The soloist’s first measures (Marien Van Stalen, first solo cellist of the Rotterdam Philharmonic Orchestra, excellent) in the Cello Concerto are immediately reminiscent of Dutilleux’s Concerto. The entry of the orchestra via the only percussion is a rather spectacular gesture. The development of the first movement, with its orchestral explosions makes one think rather to Lutoslawski. We will note the care given to the balance solist / orchestra, or beautiful lyric or poetic passages with always an orchestration as inventive as mastered. The lyrism of the introduction magnified in a superb coda. A “first class” composer and a major addition to the concerto cello repertoire. Entangled Tales: Created in 2007 by the Boston under the direction of Ludovic Morlot. With an equal craftsmanship, both in terms of form and orchestration, the work seemed to me to have a little less impact than the previous one. His Third Symphony, although appealing to the same idiom, seemed to me more successful, especially by its more dramatic postures. His use of (the) piccolo at the beginning of the work shows a remarkable search for tunes, to superacute passages, followed by great orchestral waves in the bass. Successive soundscapes followed each other, all brilliantly defended by the orchestra and the conductor Antonello Manacorda.